Summary of Service 1950 to 1964. The enclosed details are primarily based upon the Reports Proceedings and also details from documents in the Naval Historical Branch, Ministry of Defence. Acknowledgement made to the Keeper of Public Records, Public Records Office who arranged for access to the Reports held in Taunton at the Hydrographic Office. Conversion began in February 1948 and completed in July 1950. No armament fitted and changes made to provide additional accommodation and office space for hydrographic work. More boats and associated handling facilities were fitted together with a radar suitable for survey work (Type 972). Pennant Number for visual signalling purposes changed to A307. Explanation: From the arms of Captain James Cook). Under Care and Maintenance at Devonport with reduced complement. Stored for sea service (January). (Note: Additional complement joined from HM Survey Ship SEAGULL (February). Commissioned for service: 27 March 1951. (Later Rear Admiral CB, OBE, DSC and Hydrographer of the Navy 1955 - 60). Relieved Halcyon-Class Minesweeper SEAGULL employed on survey work since 1945. Diverted to join CTF26 in search for wreckage of submarine AFFRAY in English Channel. (April - June 1951). Visited by Hydrographer in Portsmouth when released from search and then resumed survey work in Dublin Bay. Carried out Oceanographic soundings and sampling between Scapa Flow and Spitzbergen. University expedition embarked and landed on Spitzbergen. Machinery condenser defects delayed continuation of sampling work on return passage. Collected expedition and paid visit to capital of Spitzbergen, LONGEARBYENN (August). Landed expedition at Gourock and carried out oceanographic programme (September). Resumed West coast of Scotland survey in conjunction with survey ML's and detached parties. Intermediate R&R visits at local ports. (Note: Areas surveyed included Loch Maddy and The Minches. recovered later after repair work at Greenock (October - November). Second Commission 1952 - 53. West Coast of Scotland Survey Continuation (1952-3). Based at Portree, Isle of Skye with detached party employed on coastlining and marking. Carried out Planned work which included check on newly established DECCA Navigation Chain for Western Aproaches - Hebrides. (Note: Radio signals too erratic for hydrographic use. Hydrographer embarked at Mallalg for 3 day visit before transfer to FRANKLIN (September). Attended Coronation Review at Spithead and was Host Ship for Hydrographer's guests (June). Prepared for foreign Service at Plymouth on completion. West African Coast Survey (July to September 1953). Passage investigations included seabed profile off Fowey and inconclusive checks on movements of water temperature layers. planned survey areas included Takoradi, Accra, and Sekondi. (Note: Shore parties lived in Bungalow leased fron a UK contractor. to be a useful asset to survey work. Sports fixtures during R&R periods at Takoradi. Carried out two day survey at Sekondi followed by a final call at Takoradi. UK Waters Survey (October - November 1953; April - November 1954). Work on West coast continued. Soundings in St. Ives followed by oceanographic measurements across Irish Sea entrance. Seabed samples obtained hourly until corer became defective (again). Boat survey and tidal observations in Heysham Bay (ML 3516 assisted but ship alongside). Isle of Arran measured mile checked with Taut Wire gear and attended by AEW scientists. Local survey undertaken by detached party during Winter lay-up. Resumed UK West Coast survey work (April - July 1954). R&R in Stornoway and refuelled at Londonderry. Scientific investigations in St Brides Bay with London University staff. Shoal examination carried out with HM Survey Ship VIDAL in Bishops Rock area. (Note: Transferred 2 Depth Charge Throwers to Bar Lightship for use in Liverpool as collection boxes. Tidewatching and boat survey parties detached in Hebrides. Ship continued sounding in The Minches with delays caused by heavy rain and gales. Hydrographer's three day visit included detached parties. Repeat of Arran measurements (July). (Note: Swiss lady in difficulty whilst swimming in Plymouth harbour rescued by line (July). Refit Period (December 1954 - March 1955). Storage facilities provided for the associated two Slave Stations. A series of meetings attended by Admiralty specialist and manufacturer was held to plan acceptance trials. Two Range DECCA Trials (March - May 1955). (Note: Position visually fixed from selected shore positions to confirm the position determined by the radio signals. A defect in ship's windlass and poor visibility caused further delays. Returned to Plymouth in late April. Further trials during May also unsuccessful. All the equipment returned to manufacturer for investigation. Repeat Trials planned for September during programmed survey work in the NW Approaches. UK West Coast Survey Continuation Work (1955 - 56). Firth of Lorne and Loch Fyne work commenced by detached parties for boat sounding and tidal measurements. Two Range DECCA System calibration and repeat trials carried out (September - October). (Note: Changes recommended to ship and slave equipment to improve reliability. Wreck of CATO fixed in Bristol Channel with assistance from HM Trawler STEEPHOLM (November). Completed wreck sweeping off Welsh coast. Slave Stations established on Ulster coast and at Machrinhanish on Mull of Kintyre. Detached party landed on Islay to set up tidal measurement equipment (April). Annual Inspection at Londonderry (May). North Channel and islands work continued (May - November). Wreath laid at British War Grave cemetery. Measured Mile survey at Anglesea by Detached Party (October - December). Sweeping and sounding work carried out off SW Ireland (November). Anglesey work continued with detached party during refit period. Families on board after sea trials (February). Hydrographer visited ship at sea prior to departure on 18 March for foreign service. Passage to Pacific Survey area (March - June). Damage to upper deck equipment including Liferafts by heavy weather in SW Approaches. Shoal examination and oceanographic work during passage to central Pacific via Azores, West Indies and Panama. (Note: Air-lift requested from USN to ensure early hospital attention. Patient initially transferred to ss CITY OF OXFORD inward bound for Panama and later to a US Flying Boat. Colon hospital later reported no permanent damage to eyes and would rejoin ship after completion of treatment Periods at High speed during this emergency made significant demands on fuel. Planned economies included use of Quarterdeck awning as a sail ! Joined other RN ships off Maiden Island for Dress Rehearsal of Test. Present for explosion of a megaton weapon dropped from an aircraft on 15 May. Personnel not essentially required assembled on F'xle and wore anti-flash gear. Some sounding work was carried out before sailing for Samoa. Shoal examinations before arrival in Fiji on 6 June. RNZAF provided aircraft for aerial reconnaissance of Natewa Bay and Vuya Passage area. Petty Officer accidentally fell into water near ship. Excellent relations established with local community leaders and Fijian RNVR. Carried out Self Maintenance Period at Auckland. Oceanographic measurements and sampling during passage and on return to Suva (June - July). Survey work in Fiji area based at Natewa Bay. Assisted by Fijian RNVR vessel VTTI (ML3555) in Vuya Passage south of Vanua Lew. (Note: This proved of restricted value and was later discontinued (July to November 1957). Detached parties landed for tidal measurements and establishment of controls. teeth (Tambuas) with Kava refreshment and dancing exhibitions with choral accompaniment. Ship open to visitors and sporting exchanges arranged. Provision of cinema shows ashore - later a standard feature with Children's parties. Entry of float "Mrs Hibiscus" drawn by ship's Landrover won a prize for 'most amusing entry' (August). Annual inspection at Hauraki Gulf, New Zealand. (November). CinC FES on board (March). Departure delayed by collision with Calliope Dock Jetty at Auckland and by delivery of new power supply generators for 2 Range DECCA. (Note: This was specially allowed to be carried off Station by Commodore Auckland,. Commodore Goff-Davies who was an Ex LOCH Class captain). There were 2 absentees on leaving but 1 was recovered later. Solomon Islands Survey (March - July). Survey programme agreed on arrival. First since HM Ships PINGUIN (Circa 1895) and SEALARK (1907). (Note: Many triangulation marks from 1947 US survey had not survived. islands were found to be incorrect. Detached parties landed at Honiara and Gizo. Ship carried out soundings, Taut Wire measurements, Reef Fixing and sweeping work, in Gizo Strait and New Georgia Sound. (Note: Astralobe observations made at Gizo in Garden of High Commissioner. Whilst at Honiara for Queen's Birthday Parade embarked High Commissioner for day at sea. During passage to Port Moresby to refuel, Packlington Reef inspected and leak in Lower Naval Store repaired (June). On return paid first RN visit to Mono (Treasury Islands) for 12 years. (Note: Position found 4.50 miles east of chart. Unconventional football match and cinema landed. 75% of population (100) came on board when 'open to visitors' (June). New Proton Magnetometer proved efficient and economic if carefully handled. Few Social contacts with Europeans. Shore Cinema shows in isolated communities a great attraction. Carried out Shoal examination work on passage to Port Moresby. Serviceman's League (Australian equivalent of the Royal British Legion) was made by the CinC FES). Passage to Hong Kong with Paying-off Pennant flown on departure from Port Moresby (14 July). Royal Marines Band greeted ship on arrival in Singapore. Interim Refit at Hong Kong (August - November). Hull Corrosion area found smaller than expected. Boiler tubes replaced without delay in completion. All survey boats were refitted after very extensive use in previous year. vessel flooded soon after departure for Leyte. (Note: Machinery satisfactory but some defects in electronic gear remained (November). Ship's cat failed to re-join and found in HMS ST BRIDES BAY. Passage to New Britain (November). (Note: Pinnacle reported by USS BENHAM in 1944 found to extend from 1500 fathoms to 21 fathoms. Second reef found 5 miles NW of its charted position and new name proposed "Unexpected Bank"
Solomon Islands survey Continuation (November 1958 - February 1959). Shoal Examination in New Ireland area at LIHRI and BUKA Islands. Detached party with boat at BINA Harbour and ship work at FUI Bay, Malaita Island. (Note: Evidence found of recent volcanic activity in BUKA area with deep water and shoals adjacent. Third fracture of windlass shaft. Repaired later at Port Moresby. Survey work at BINA considered very necessary and worth maximum effort possible. (Note: Special written request received from local headman at village of Arabala on island of Malaita. Villagers were allowed on board and Doctor visited local Mission hospital. SW Pacific survey Continuation (November 1958 - February 1959). Christmas at Port Moresby with superlative hospitality once again. (Note: Reciprocal invitations for Children's Party on Xmas Day and also to Cinema show. New shallow water area south of Guadalcanal found on New Year's Day. (Note: This was identified provisionally as ‘New Year Bank’ and surveyed later (January 1959). Weather conditions during depressions reminiscent of those in Atlantic. Increase in defect load noted, particularly distiller pump, and problems with boilers and generators. Fleet Boilermaker visited ship at Port Moresby. Increase in malaria cases noted and attention paid to correct use of Paludrine. (Note: Cinema performance and Doctor visit at Bina before leaving. Sailed for Sydney to exchange Captain and surveying teams joining by air from UK. Kelso Bank delineated and 24 fathom least depth established. Press reception on arrival at Sydney with much interest in ship's cat (3 March). Change of Hydrographic Officers at Sydney (March). oceanographic work in South Pacific area. Whilst on passage to Fiji diverted to Auckland because of Main Engine defect and hull leak. Advance party sent by air to Labasa to prepare for survey of approaches. (Note: Local corrosion discovered during docking. DED extended and Station Leave granted. (Note: Five absentees on sailing. Shoal examination and Oceanographic Station work on passage. Fijian welcoming ceremony an arrival (See later). Use of lighter reduced time taken for survey work in Labasa (Malau) Approaches. Vuya Passage south of the island of Vanua Levu surveyed (June). Boiler defect due to distorted tubes limited power available. Attended Queen's Birthday Parade at Labasa and provided Gun Salute (June). Survey of Passage between Ovalau Island and Viti Levu completed (July). Tidewatching party at Levuka. Weekends spent at Levuka and Suva. TELLUROMETER demonstration to local Survey Department at Suva. (Note: During this period an increase in malaria cases was again noted. Detached Party sent ahead by RNZAF aircraft to start survey at Betio Anchorage, Tarawa. Gilbert Islands Surveys (August to November 1959). First visit by RN ship to Tarawa in recent years. TELLUROMETER proved most valuable for work in this survey period. Detached Party with boats accommodated in RNZAF Bairiki and another at Nikunau Island. SMP at Suva with reduced party left at Tarawa. Carrried out survey between Abemama Island and Lagoon. Detached Party and ship used (September - November). Boat investigation made to ensure safe entry. Returned to Gilbert & Ellice work. (Note: Result five mile different from US Chart. Painted ship with assistance from prisoners in local goal. Each visitor received grass skirt. Carried out Running survey at Nui Island – 3.5 mile discrepancy (North of charted position). Position of Alita Reef, Laughlan Island and Stewart Island investigated (November). Called at Port Moresby and Rendezvous with HM Frigate LLANDAFF. Carried out Shoal examinations in Flores Sea. transmitter equipment resited in Blacksmith's Shop. Old site converted for use as Asian Mess and Tailors shop. Original radar (Type 972) replaced by latest design for survey use (Type 979). Incomplete delivery of items delayed setting to work and acceptance for use. Air conditioning provided in Chartroom, Canteen/Sick Bay and Radar Office. Bridge Plotting Room enlarged, layout and natural ventilation improved. Inspection of hull showed it seemed in excellent condition. Need to completely destore ship with all items landed into shore custody by dockyard. Inspection and maintenance of all Hydrographic stores and equipment whilst not in use. Deficiencies in first supply of part of 979 Radar and spares for other new equipment. Carried out LAMBDA Equipment Trials in Malayan area (April - May 1961). Carried out at Paula Ticman with HM Survey Ship DAMPIER in company. DECCA Slave Stations set up ashore to carry out trials using new survey techniques. (Note: Assistance provided by 848 Squadron HMS BULWARK to land and collect heavy items. communication for surveying or for emergency purposes. learnt in the earlier acceptance trials off the west coast of Scotland was again confirmed. Passage to New Hebrides (May - July). Soundings were made along proposed route for Commonwealth telephone cable in Celebes Sea. (Note: Calls made at Miri, Borneo and Port Moresby for fuel. Contacts made with HM Australian Survey Ships DIAMANTINA and PALUMA. Prior to arrival at Vila weather conditions deteriorated. Hydrographic survey requirements discussed with Condoninion authorities at Vila after official exchange of calls. (Note: Social and porting exchanges during the three day visit (July). Santo Island where operation was carried out ashore on ME1 rating (July). After Maintenance Period at Suva commenced survey programme NW of Vanau Levu. Called at Naduri on north coast of Vanau Levu for traditional ceremony. and the other to land. Dancing and singing by the local ccranunity followed in profusion. Fijian Islands (Vanau Levu) Survey (July - September). (Note: Assistance provided by local Fijians. were available including clothes washing, provision of food, cooking and mail collection by 'runner'. Fijian Islands (Vanau Levu) Survey (July – September 1961). school children and by social entertainment for the local notables. A Cinema performance ashore was provided. known poor records of Conduct. work fell and injured his back. Survey work in Savu Savu and Tilangitha passages completed and returned to Suva (Sept). Preliminary work in Gilbert and Ellice Group (September). Embarked local official for passage to Tarawa. Main effort made at Abaiang Lagoon including use of detached party. (Note: Good relations were established with shore communities of Beito and Bairiki. Maintenance Period at Levuka on Ovalua Island coincided with 'Cession Day' to mark the transfer to Britain in 1874. Large Scale survey at Savu Savu Bay. Carried out Harbour survey at Vila, New Hebrides. Medical case evacuated by RNZAF to Suva. Made good weather damage to paintwork and fittings at Bay of Islands before entry. Return Passage to Fiji (January 1962). Hydrographic work at Vila, New Hebrides resumed and harbour survey completed. Continuation Survey in Fijian Waters (February – April 1962). LAMBDA assisted survey with boat work in approaches to RINGGOLD CHANNEL, NE of Vanua Levu. (Note: At Fijian Government request in anticipation of increased Bauxite export requirements. Green Slave Station established at Napuka. Red Slave position at Ihikombia Island (North of Group) proved unsatisfactory as natives unfriendly. Alternate site at Wailangilala used. Both stations operational by 23 February but Green Slave resited at Wainunu (March). Detached party with two boats at Wainunu River. (Note: Two calves presented by French Consul. Dangerous situation due to Steering failure near Undu Point avoided by quick response to 'Full Astern' demand. Report made "Constant state of alertness has to be maintained in these waters "
Survey completed (700 Square miles) and Slaves dismantled (April). Rot discovered in survey boats gave rise to concern. Gilbert Islands survey (May - June). Detached parties landed with boats at Tamana and Abaing with ship sounding between islands. Marakei Island found to be 5 miles West of charted position. (Note: Party landed at Tamana for local feast and dancing.
. Rating married at Suva during Maintenance Period. Detached party landed at Arorae for stellar observations and ship carried out Sketch Survey. Participated in Queens Birthday Parade. .Sketch Survey carried out at Maiana Island. Passage to Singapore (June - July). Large crowd with Police band attended departure from Suva after 12 months duty (20 June). All on board had good cause to recall with pleasure the generous hospitality of the local people who had also contributed so much to assist the work accomplished. Refit Period (August - October). (Note: 11 Junior Seaman Ratings and Chinese Galley staff had all joined by end August. Defect items other than survey boats all completed by Terminal Date which was most unusual. All trials completed by 24 October. Engine Room equipment results were satisfactory but aging electronic equipment required further attention. Passage to Tarawa to Gilbert & Ellice Islands (October - November). Intercepted suspicious vessel off Kiadat. Note: James Cooks’ birthday observed on board. Deep water sampling in Mindanao Trench for National Oceanographic Institute. New measurement recorded - 6297 fathoms. (Note: This reading was later considered suspect due to use of defective equipment. - See below). Bathythermographic work restricted after loss of thermometers. Extent of LYRA Reef determined and variations in depth between 20 and 2000 fathoms measured. (Note: Work continued day and night. Core sample taken for British Museum. reading obtained in October for the Mindanao Trench. Gilbert and Ellice Continuation (November 1962 - February 1963). After arrival at Tarawa detached parties landed at NONOUTT, KURIA and BUTARITARI. (Note: Radar used extensively as TELLUROMETER not available. Echo Sounder outfit E/S 771 not satisfactory for deep soundings (November - December). Christmas spent at at Suva with alongside secure berthing and workshop available. (Note: Three VSO civilians embarked (2 male and 1 female) for work on islands. Bligh Water (Fiji) Survey continuation work (January - March 1963). Two Range Decca Stations established at Viti Levu and Vanu Levu for Northern Approaches survey work. Reconnoitred Navula passage in anticipation of Royal Yacht arrival. (Note: Fijian and Indian community welcome ceremonies at Port Ellington and Vaileka. Over 2,000 visitors despite 8 mile journey to ship. Met Royal Yacht at LAUTGKA and accompanied her to Suva. Sailed before arrival due to delay of Royal flight. Detached parties remained to continue work. Royal Visit to New Zealand (February - March). Attended Waitangi Day ceremony and provided 60 ratings for crowd control. During passage to Auckland with HM Submarine TAPIR, some exchanges of crews. (Note: 20 ratings went overland. Station Leave granted during the six day stay. Continuation of Fiji Survey (March 1963). (Note: Boatwork progressed but Motor cutter damaged on reef and sank. During Yandua Passage and Round Island Passage ship sounding and sweepingcarried out. Intermittent problems experienced with Two Range Decca equipment. Diverted by Search and Rescue duty NE Canton Island in Phoenix Group for Royal Flight to USA (28 March). Shoal examination work confirmed 1943 US data. Embarked Bear Admiral Irving (Hydrographer) and Mr Pascoe (Chief Civil Hydrographic Office at Port Ellington. (Note: Visits were also paid to Slave Station. Passage to Suva via Vatui Ira Channel to disembark party (6 April). Annual Inspection and Docking at Auckland (April – May 1963). GEMINI dinghy supplied which later proved a valuable asset to survey work. Bligh Water Continuation Survey (June). Two-Boat camp re-established on Yandua Island. (Note: Decca investigation resulted in only slight improvement. Ship sounding work continued with completion target date of mid-July. During fuelling visit to Suva prepared to give assistance during South Pacific Games. Visit extended to allow maximum maintenance effort in view of future programme. Embarked Mr. E.D. Stroup of Baltimore University for oceanographic work. Heavy Duty Bathythermograph unit fitted. Detached Party landed at Nonouti with boat for local repeat survey. Four day farewell visit to Tarawa with social exchanges. Ship sounding at Nonouti and gravity survey at Tabitevea using GEMINI. Meridianal hydrographic investigation near Ocean Island. Water sampling and current readings down to 400 metres at 50 metre intervals. Ridge investigation carried out at position between Tarawa and Mainana (August). Bathythermograph measurements made in Mainana - Kuria and Aranuka - Nonouti gaps. Variation swing and soundings carried out on passage to Ocean Island. Special survey made to prepare for laying of deep moorings for buoys at Ocean Island. Embarked Gilbert and Ellice Islands competitors for South Pacific Games at Suva. (Note: Presentation was made to ship made for help given (August - September). Bligh Water Continuation work (September). Completed sounding work for which air photographs proved valuable. Electrical storm affected operation of 2 Range DECCA. After SMP at Suva recommenced survey on 1 October. At 1737 whilst seeking a satisfactory anchorage near Vatu - Ra ship grounded on a coral head and was badly holed forward. Refloated after 10 hours. Hull examination of hull showed major flooding. In order to carry out temporary repair on slip at Suva, 1300 tons of equipment removed. Damage assessment carried out included use of divers from HMNZS TARANAKI. Board of Enquiry convened at Suva on 15 October. Hydrographic Member - Commander J. S. N. Pryor ((H) Charge HMS DAMPIER). Crew accommodated at RNZAF Lauthala Bay. Ready for sea after equipment refitted (22 November 1963). The ships saluting guns were landed for use by Fijian Military Forces. Carried out ship sounding on approaches to Bligh Water. Swept channel off Labassa, Vanua Levu to check depth for safe use by manganese ore ships. Inspection made of reef passage at Ngau. commemoration of the close association of the survey ships with the islands in recent years. Embarked sugar and building materials for delivery to New Hebrides. NOTE: Emergency stores for use at Tongoa after hurricane during November. Shore survey was carried out at the end of telecommunications cable in NE New Guinea at Madang. Called at Manus for fuel. Spent Christmas at sea followed by refuelling again at Labuan. Sailed for Gan on 12 January. Indonesian Gunboat approached in Strait but left when Royal Malayan Navy Motor Launch appeared. Replenished at sea after leaving Gan on 21 January. Called at Aden, Malta and Gibraltar. On arrival in Home Waters on 24 February 1964 the Hydrographer of the Navy embarked and the ship wore his flag for its return to Devonport Dockyard for the last time. 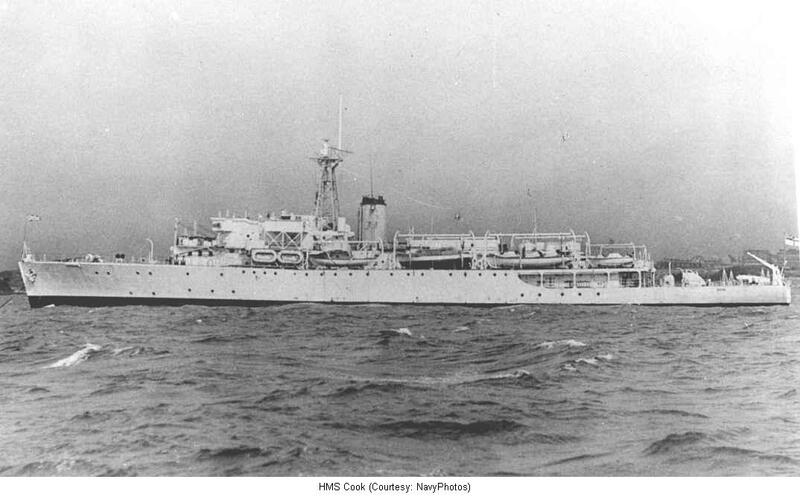 HMS COOK was withdrawn from service and Paid off on 1st May 1954. The ship was placed in Reserve and destored. She was put on the Disposal List and in 1968 sold to BISCO for demolition. In April that year she was towed to Zeebrugge for breaking-up.